What's New: the best new accessories for him and for her. 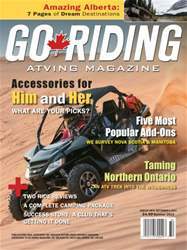 Good to Know: Want to give your ATV a lift? We'll show you how. Making It Happen: The Nation Valley ATV Club is a success story. How do they do it? Five Easy Pieces: We poll Nova Scotia and Manitoba to find out what accessories sell best. Taming Northern Ontario: Old and new friends tackle some prime Canadian geography together. Ride Review: The 2013 Kawasaki Brute Force 750 4x4i EFS. Ride Review: We set our sights on the 2014 CF Moto Snyper 800EX Side-by-Side. Adam Parks- From the Backyard to Baja: We profile the Canadian racer who's tackling incredible terrain - and deadly ambushes - in the Mexican desert. Amazing Alberta: Seven pages of dream destinations. Plus the provinces check in with updates, a Stay and Ride Guide feature, the PG and A Showcase and more!